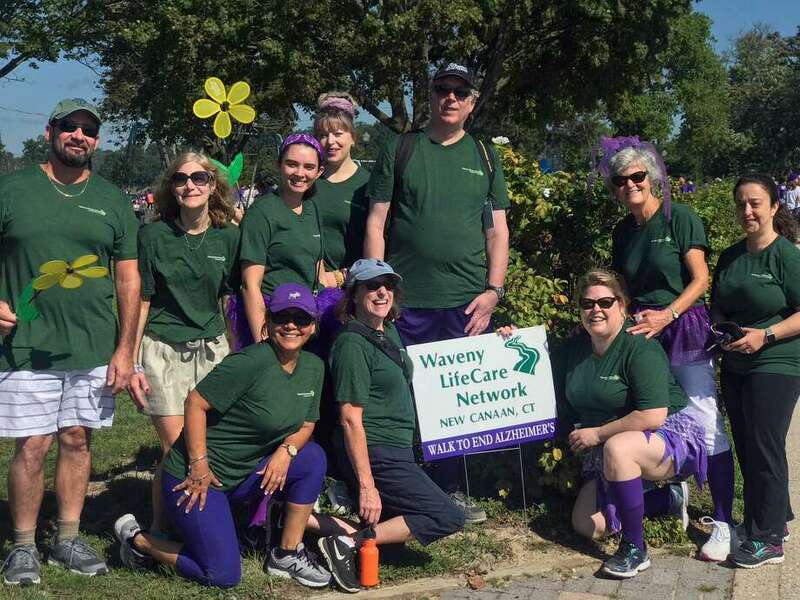 Waveny LifeCare Networks 2018 Walk to End Alzheimers team, the Waveny Trekkers, raised essential funds for the Alzheimers Association that will be used for care and support services for people with Alzheimers disease. More than 25 walkers of Waveny LifeCare Network staff, volunteers and families helped fight Alzheimers disease by participating in the annual walk at Calf Pasture Beach in Norwalk on Sept. 16. All returning teachers, faculty and administrators came together to share breakfast and reconnect with each other after the summer break at New Canaan Public Schools’ annual convocation. It was also a time to welcome new hires and invited guests, including the Board of Education and town officials. This year’s event took place in the New Canaan High School cafeteria at 7:30 a.m. on Aug. 27, and speakers included Human Resources Director Gary Kass, Board of Education Chair Dionna Carlson, and Saxe Middle School STEM teacher and NC Association President Vivian Birdsall. The convocation’s keynote address was presented by Dr. Bryan Luizzi, who is entering his fifth year as superintendent of schools. Dr. Luizzi began by thanking everyone for their hard work throughout the district. His address also underscored the importance of a student’s experience at school, beginning with how students felt when they came home that first day - and how important it was for everyone in the audience to be cognizant of that feeling. As the school year progresses, emotional intelligence remains a central theme throughout the district. Luizzi announced Dr. Marc Brackett, director of the Yale Center for Emotional Intelligence, would be returning to New Canaan Public Schools on Oct. 18, meeting with and speaking to faculty and staff in the afternoon and presenting a lecture for parents that evening. Afterwards, the teachers returned to their buildings for their “meet and greet” events, professional learning, and preparations for a school year. The Carriage Barn Arts Center in Waveny Park kicked of the 2018-19 season with the Sept. 9 opening of the 2018 Member Show. The show features over 150 pieces that celebrate the range, interests and talents of Carriage Barn member artists working across all subjects, styles and media in art. Nancy Woodward’s piece “Two Stories” won the Betty Barker Award for best in show. The exhibit runs through Oct. 13 and gallery hours are Wednesday through Saturday from 10 a.m. to 3 p.m., and Sundays from 1 to 5 p.m. The gallery will close at 3 p.m. on Sept. 30. Admission is free and open to the public. Other upcoming programs and events include Live Jazz Night and Album Release Party with Michael-Louis Smith on Oct. 6, and the “Capturing Waveny” Plein Air Event on Oct. 6-7. Artists will be painting, sketching and photographing scenes throughout Waveny Park. All are invited to participate or come see the artists at work. Completed works showcasing New Canaan’s Waveny Park will be exhibited and for sale in the gallery Oct. 18-21. For details and to register as an artist, visit carriagebarn.org. Additionally, a call for entries is underway for “Art For Alz,” a special exhibit opening Oct. 26 to benefit the Alzheimer’s Association of Connecticut. The theme of the exhibit is Love & Light, and artists can submit their work online at carriagebarn.org/alz by Oct. 6. The New Canaan Beautification League presents “All the Presidents’ Gardens” with author Marta McDowell at its Autumn Luncheon on Oct. 4 at Woodway Country Club in Darien. “All the Presidents’ Gardens” tells the untold story of the White House grounds and traces the tale of how presidents and their families have left their imprint upon the 18 acres surrounding the executive mansion. McDowell writes and lectures on gardening topics and teaches landscape history and horticulture at the New York Botanical Garden, where she studied landscape design. She also consults for public gardens and private clients. The luncheon is $40 per person and is open to the public. To RSVP, send a check in the amount of $40 per person to Gloria Simon, 143 Butler Lane, New Canaan, CT 06840 with choice of entree. For menu and information, visit www.newcanaanbeautification.org. Clothes to Kids of Fairfield County will be hosting its third annual Cook for Kids fundraiser on Oct. 4 at the Stamford Museum and Nature Center in Stamford. The event will feature live music, a silent auction, door prizes, beverages donated by Giovana’s Wine & Spirits, hors d’oeuvres prepared and donated by The Blind Rhino, Kazoo Sushi, A Pinch of Salt Catering, The Mumbai Times, Susan Kane Catering, Fire & Rice, A&S Fine Foods, Dinosaur BBQ, Olio Restaurant, Melt Mobile and Shaken & Stirred and desserts by Izzy B’s and DiMare Pastry Shop. Clothes To Kids of Fairfield County provides new and gently used clothes to low-income and in-crisis schoolchildren in Fairfield County. Every eligible child is able to “shop” for their clothes in CTKF’s store in Stamford, giving every child a unique shopping experience so they can attend school feeling comfortable and confident in their clothes. Each child is assigned a personal shopper during their one-hour appointment to help them select out the clothes they like and would like to try on. The organization even offers a two-week return policy. Each eligible child receives a free week’s worth of clothes twice within a 12-month period, which includes five tops, four pants, one dress, one jacket, seven new pieces of underwear, three new bras, seven new pairs of socks and a pair of new shoes. For information, determine eligibility or to buy tickets, visit www.ClothesToKidsFairfieldCounty.org. Children that get free or reduced lunches at school are eligible for the program.